Abby arrived safely on La Reunion yesterday evening (PDT). She met with Zac who brought her a backpack with some clothes, a hairbrush (! ), and a few personal belongings. She was thrilled to see some familiar faces and have met another milestone in her long voyage home. Abby still has a long trip ahead of her and will blog again as soon as possible. Once Abby arrives back in Southern California, there will be a press conference on Tuesday June 29 at 10am. Press accreditation is required for members of the media. This will be given by email and you will be required to show identification with company logo at the door.To obtain accreditation please email info@mercerpr.com with details of your organisation. For more information please phone (USA) 310.776.7557. The Australian government has never asked us to contribute anything towards the recovery costs and has no intention of doing so. Australia – like the USA and other countries with significant coastlines, are part of the international agreement to assist those who need help within their search and rescue territories. All of these nations do this for citizens of all countries and this is funded by the respective governments. Australia has a robust media and each time there is a rescue – irrespective of the nationality of the person concerned – the media alone tends to make this an issue which in turn stirs up some emotions. We value and appreciate the Australian government and volunteer organisations – as we do the French authorities - who assisted Abby. We were approached by Magnetic Entertainment last year before Abby departed to shop a reality TV show based on our family. Abby's trip was already sponsored. Their idea was to do an inspiring show about Zac and Abby’s adventures, what our family was like and what made them as strong and independent as they are. The show was shopped and not sold. All rights were returned to us. There is no reality TV show or documentary in the works and we are not pursuing one. It is sad and ironic that some of the media - who are sensationalizing and twisting Abby’s story for profit - accuse us of doing the same thing. We can assure you that our priority is the protection of our children, something all parents will understand. Everything is going well out here. I'm still getting used to walking around on board and it takes both hands to keep myself from falling up and down the narrow halls. I'm still having trouble typing on this key pad but I've got a few more days to get the hang of it. Everyone on board has been really friendly. They have come a long way out of their way to help me and I am so thankful that they did. My mom has told me about all that the different rescue groups did to help find me. So thank you to all of you. I had only hoped that a ship would pass by me within a few weeks. I am really in awe. Thank you to everyone involved. The captain is a big, friendly, bald guy with a big beard. He speaks English pretty well and he says, "Is no good to worry about the boat. Is just a boat, you is safe. You should not think about the past." Which is true, but its hard to keep my mind off everything that's happened. Everyone in the bridge has been fending off the press and I'm very grateful for that. I really don't want to start doing interviews quite yet. I have started writing. At first I decided that I wasn't going to write a book. But then I started to think about all the good times Wild Eyes and I have had together. All that's left of the voyage of Wild Eyes are my memories, eventually they will get fuzzy and I won't remember all the details. I don't want that to happen. Wild Eyes and my trip have been the best thing I have ever done or been through and I don't ever want to forget all the great times we have had together, or the bad ones for that matter. The story of Wild Eyes is over, but my story is still going. I'm still out on the ocean headed to a little island called Kerguelen and then will be on another boat for ten days up to an island near Madagascar. From there I will eventually make it home. So, on goes my adventure! A note from our blog moderator: Please be patient with as we go through over 12,000 comments that have come in during the last 3 days. We are getting through them as quickly as we can. 'Abby Sunderland was in great spirits after being spotted' say rescue members. 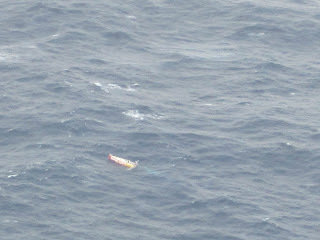 A crew of 11 SES and FESA volunteers that were on board the 'spotter' airbus returned to Perth just after 7:30pm last night after successfully locating the troubled vessel in the Indian Ocean. "Abby is in very good spirits," he said. "She's obviously keen to have some assistance, but she is in very good spirits. "It was a very happy moment for all of the people on board the plane," he said. "However, it was a very serious moment as well, and we were all concentrating on the job at task which was to make contact with Abby. 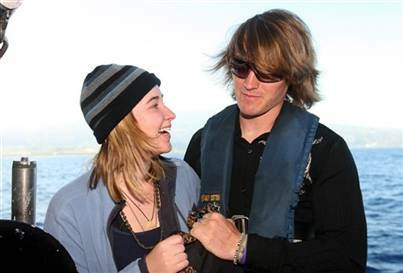 "The crew then made radio contact with the young sailor, with the first words conveyed being "This is Abby". 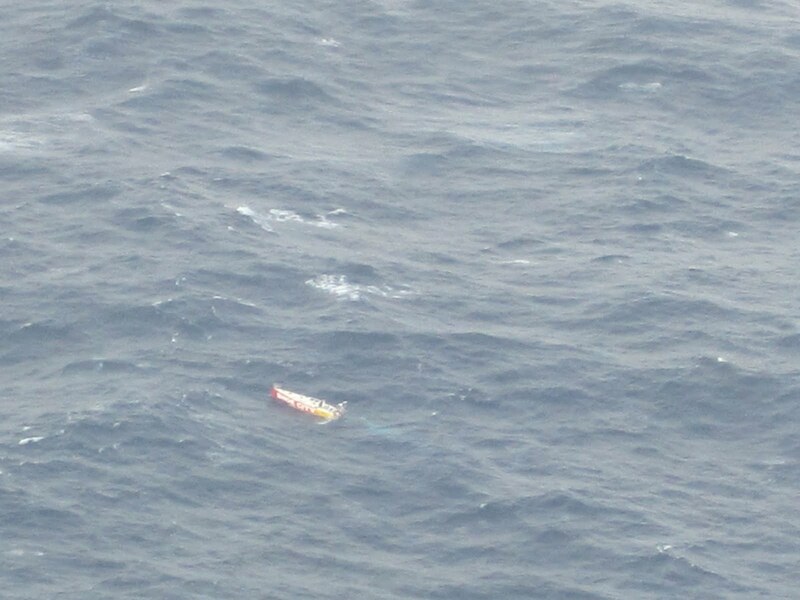 Mr Blackshaw said the crew instructed Abby to activate two further EPIRB devices tomorrow afternoon to ensure a continuous signal for rescue crews to spot her. FESA spokesman Chris Lawson confirmed a second, smaller plane would leave Perth Airport early this morning to conduct another sighting and ensure Abby was okay.SES volunteer Michael Wood, who spotted Abby's vessel from the airbus, said he had been excited to locate the boat. "Because I was at the front of the plane, I just happened to spot Abby as she came into the field of view," he said. "It was very nervy at first, but very exciting that positive contact had been made." We're all mindful that Abby's got a number of hours left so we've all got our fingers crossed." Sgt Mike Wear, from WA Water Police, said Abby sounded "very upbeat and very strong" during the brief contact. "It certainly was a very emotional event to be able to speak to the young girl Abby today and see her in that predicament out there," he said. "It was just a very small dot on the ocean – she was on the back deck (and) she was very hard to see. We don't know much else right now. The French fishing vessel that was diverted to her location will be there in a little over 24 hours. Where they will take her or how long it will take we don't know. More updates as news comes in. I meant to blog yesterday, but I was having some problems with my Thrane & Thrane again. As you can tell from this blog, I was able to play around with it and get it going again. Everything has been going well out here. I have been enjoying some nice moderate 20-25 knot winds out of the SW. Surfing down 20 foot waves has been very nice really. The wind is beginning to die down tonight, it will probably be pretty uncomfortable for a little while. After the wind dies, the waves stay pretty big for awhile and without the wind you end up just rolling gunwal to gunwal. It definitely makes for a bad night of sleep, but the wind won't be down for long. I'm almost half way across the Indian Ocean! It really doesn't feel like it. I keep looking at my charts and there never seems to be a big difference from the last time I checked, but I am ticking off the miles slowly but surely. The weather looks like it could pick up a lot in the next few days. I could have winds up to 60 knots, so I'm getting things all tied down and ready for some big winds. Well, it's getting late over here so I should go, but I'll try and write again tomorrow. 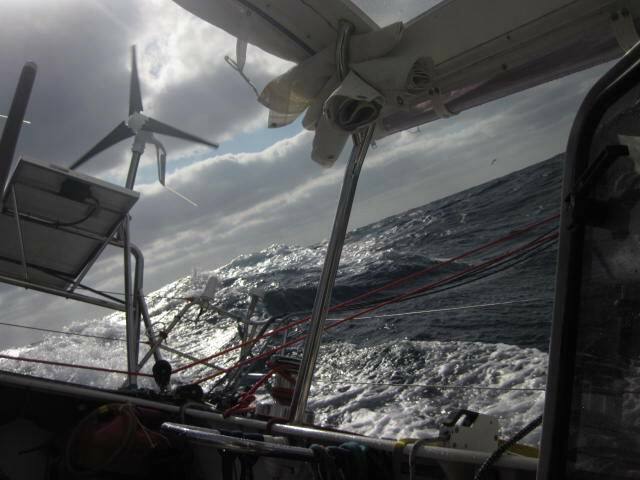 I've had another quiet day out here with no more then 12 knots all day. I'm still managing to make decent speeds, around 6-7 knots. I've been able to get my heater working today and though I haven't gotten very far, I'm beginning to sort out everything in the back that got wet. The wind should be picking up over the night and I am looking forward to another biggish blow soon. Wild Eyes is doing very well and I am finally getting ahead with all the repairs. My two auto pilots seem to be working well - it's such a relief to have reliable pilots. I am having a little trouble writing my book. It's so hard to start a story when so much has already happened. But now that things are working better I will have a lot more time to work on it. 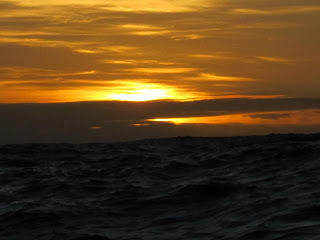 Well, today's blog inst much of a thriller, but that's all that's going on aboard the good ship Wild Eyes at the moment. I meant to get some new pictures today but got kinda busy working on things so I'll try and get some more up soon.